Yeah, it’s been a long time since my last update. But I’m still here drawing cars whenever I get a chance! I have to be honest though – I haven’t really had much of a chance for the past few months with work and real life eating up all my free time. I’ve been so busy that any time I found myself with enough time to sit down and draw a car, I just didn’t have the energy to do so. So I basically just sketched and doodled a lot, trying to ensure that I don’t lose practice. With that said, I haven’t drawn much of anything since last July that I feel is worthy of posting to this blog. But I’m having the itch to start drawing with vigor again, and here is my first attempt. It’s a sketch of a slightly modified 1988 Ford Mustang GT (wide tires plus aftermarket hood), and my goal was to sit down and draw this from start to finish in one fast session. Hey – like I said, I don’t have much free time these days so I wanted to take advantage of the several hours I had to spare. This drawing only took about an hour to do, which surprised me due to the fact that drawing real cars takes a bit of extra time to make sure the proportions are correct. Is this drawing perfect? No. And I don’t care. I just wanted to draw a Mustang darn it, in a loose but stylistic way. Just like all my other automotive art, this was done on a Wacom Graphire 4 drawing tablet using SketchBook Pro. I enjoy your work. I’m looking for some art work for my office and was wondering if you sell copies of you sketches. I’m interested in your sketch of the 1988 fox body Mustang. I’m hoping you will respond. Hi Kevin – thanks for the compliment. I don’t sell my work, but you are free to print this sketch if you’d like. Unfortunately, this is a low-res drawing and I don’t think that I have a larger version of it. I’ll check my archives tonight and will email you if I have something larger. Hi would you do a sketch of my 89 mustang please! Your work is awesome!….only thing though.. I have no money:/ but if so that’d be awesome!! If I had time I’d definitely do it! 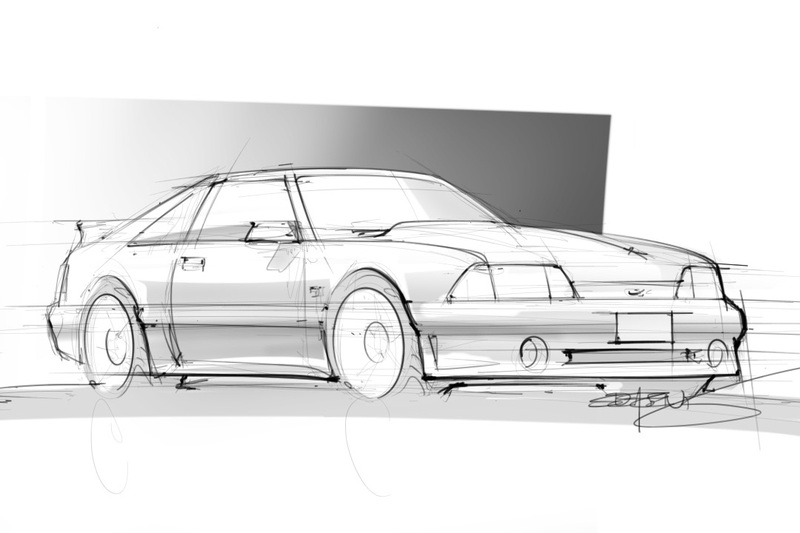 Hi there, I know this is probably a long shot but I am looking to get this printed out to 16×20 for a friend’s birthday – the Fox body is his favorite and he’s also an engineer so this piece would look amazing in his office. I see that you don’t sell your work (which you should because you are quite good) do you think this drawing could be printed to 16×20 without loosing the integrity of the drawing? .. Sorry this is long winded. Hi Annie – 16×20 might be a bit of a stretch for this one (the original size is 1200×810 @72dpi), but it is a loose sketch anyway so losing a bit of quality at that size might not matter much. I’ll send you the original file and let you do some printing experiments. I hope your friend likes it! Scott on Manga Studio for drawing cars?